When you go to a restaurant, the bottles of wine are not decanted ahead of time, so you taste the wine as it is just opened. You go to a Chinese restaurant but are unsure of which wines to pair with the cuisine. You opt for tea. The first point is common for any type of restaurant. Why would restaurants decant bottles of wine, if they do not know which bottles people will order that day? While the second point, is more specific, and can make or break a nice meal. My experience below, of pairing 4 bottles of wine from Blue Grouse Estate Winery, (located in Duncan, BC), with Chinese food from the Sun Sui Wah Restaurant on Main St in Vancouver, will hopefully give you some ideas of what you can do if you find yourself in a similar situation. I reviewed their wines before, and I thought that pairing these wines up with food and writing about the experience would be very interesting, both to me, and to you. 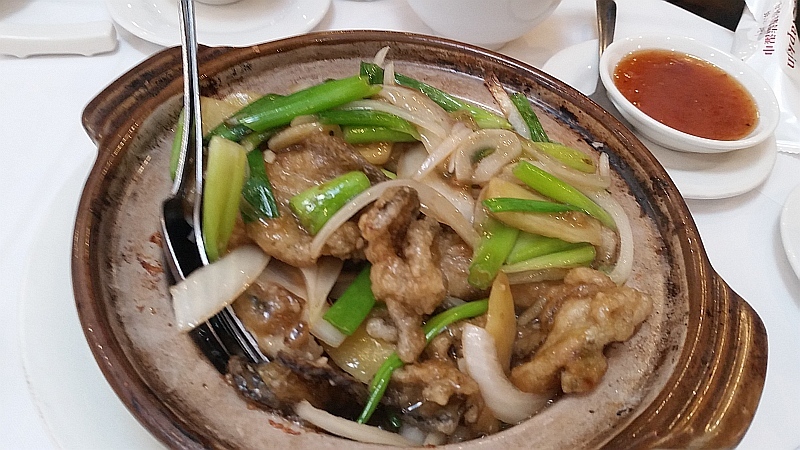 Why did I pick to pair these wines with Sun Sui Wah’s food? 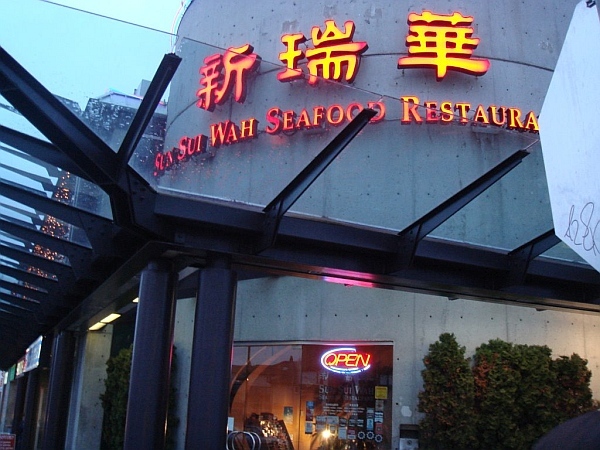 For one, there are many Chinese restaurants in Vancouver. 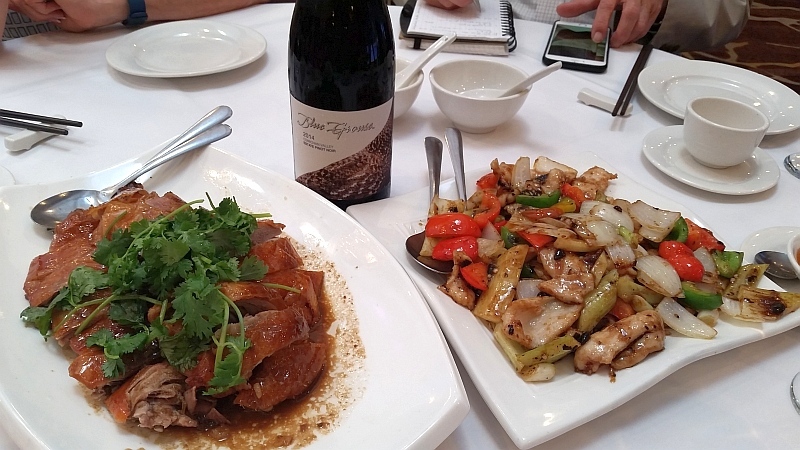 The other reason, is that I think cool climate Pinot Noir, Rose, and Pinot Gris from Blue Grouse will be very complimentary to Chinese food. Lovely, delicate, red fruit aromas and flavours, and refreshing acidity in the wines should work well. Did it? These wines were chilled before I ventured out to Sun Sui Wah, and only opened once I arrived at the restaurant; so no decanting. The Shredded Pork was light and creamy. The acidity in the wine balanced that creaminess. The fruitiness was a complementary flavour to this more neutral flavoured dish. A recommended pairing. Rose wine tends to show tart red fruits, like strawberries, and/or other tart flavours, such as red currant or tart red cherries. I thought the tartness and red fruit flavours, and the acidity in the wine, would be a nice foil to the earthiness and saltiness of the oyster in this dish. 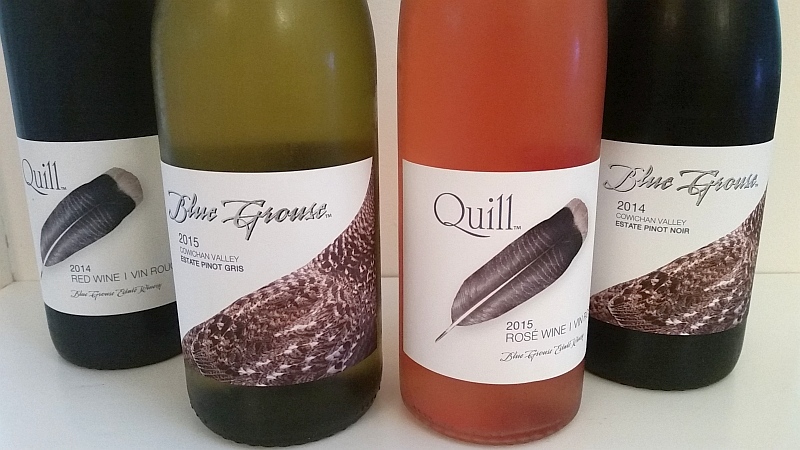 The Blue Grouse Quill Rose Wine 2015 was made from the Gamay Noir grape, which tends to be low in tannins and has nice red fruit flavours, much like it’s cousin, Pinot Noir. This wine had aromas of strawberries, red cherries and light lees. It was dry on the palate, with above average acidity, and a light acidic prickle on the tongue. Flavours of tart red cherries, strawberries, and rhubarb. Longer length with those red fruit flavours continuing to the finish. Bright acidity on the finish. Overall an excellent rose. Rating . The braised oyster was first lightly battered and then deep-fried, giving it a nice crispy outer texture, and a creamy, earthy, salty inside. The ginger added some sweet spice to the dish. I really liked how the tartness of the wine matched up with this dish. Red fruit flavours were a nice counter balance to the earthiness of the oyster. My favourite pairing of the dinner. The pairing was with the Black Bean Chicken, which was not my first choice as this is quite a full-bodied wine with firmer tannins. I did have to accommodate my dining guests food preferences. If I had my own choice, I would have selected the Sliced Filet Mignon in Black Pepper Sauce, which I thought would have the big, bold flavours to balance the wine. That being said, black bean sauce has dark, bitter flavours, that I thought may make a complimentary pairing to the Quill Red wine. Both the wine and the dish were wonderful on their own, but the pairing was just ok. Neither enhanced or detracted from the other. As expected the fat just under the crispy skin of our BBQ duck, melted on my tongue, and was nicely cleaned up by the acidity in the Pinot Noir. The 5 Spice Powder also I thought brought out a cedar component from the wine, which was not obvious as soon as I opened the bottle and poured our glasses. A really nice pairing. I also tried the BBQ duck with the Rose wine, and that also was quite good, with the tart red fruit of the rose, being like having roast duck with sour cherries. Hopefully these pairings, and my comments, has given you some ideas of similar pairings you may want to try when you go out for Chinese food. You may want to view a restaurant’s wine list online before going out for dinner, but you also have the option of bringing your own bottle(s) of wine and paying a corkage fee. There is no standardized pricing for corkage, so you need to check with the restaurant fee ahead of time. At Sun Sui Wah, their corkage fee is $15/bottle. If you want to buy a few bottles of Blue Grouse Estate wine, you need to order directly from the winery. The web link to the Blue Grouse Estate Winery store.